Enjoy reading tips from an expert? Ed Neir is your guy! 4 invaluable ways to winterize your Bay Area home! Use this invaluable list of 4 ways to save money, preserve (and, potentially, increase) your home’s value and ensure that you will be comfy and cozy this winter by taking action now. Unlike the vast number of other states in our amazingly diverse nation, we in the Bay Area are fortunate enough to experience relatively mild winter weather. That said, there are still things I would encourage you to do to winterize one of your most valuable and enduring assets – your home. 1. Replace or clean your furnace filter to safeguard your furnace and reduce energy expenses. ​​Although often overlooked, and, at times, altogether forgotten, it’s very important to replace or clean your furnace filter each month throughout the winter months. I suggest that you make a point of taking it out and looking at it on the same day each month – for example, on the 1st Saturday. Given nearly every one of us now carries a smart phone, it is easy enough to set a reminder on your calendar to do this from November through to March or April of the next year. Why is this so important? Dirty filters restrict airflow - and they actually increase energy demands. The primary role of the air filter is to protect the blower fan and other system components from airborne particles that are pulled in thru the return duct. As the furnace filters the incoming air, it's also improving the quality of the air it returns to your house thereby preventing contaminants from being recirculated. Many mistakenly believe that an air filter's role is to clean the air you breathe within your home. While there is some truth to this, an air filter's actual primary purpose is to protect the furnace. Furnace air filters happen to employ a special rating system called MERV (Minimum Efficiency Reporting Value) which rates the overall effectiveness of a filter on a scale of 1 to 20. The higher the rating, the more efficient the filter is at trapping dust particles and other airborne contaminants. Typically, a MERV rating between 8 to 11 is adequate for most Bay Area homes. A filter with a rating of 8 is designed to filter out pet dander, pollen, hair, lint, dust and dust mites. The advanced filters, beginning at 11, remove everything an 8 filter does, along with mold, smog and smoke. Premium allergen control starts at a 13 MERV rating, which can remove viruses, allergens and bacteria. ​To be safe, please be sure to check your furnace manufacturer's specific recommendations for the maximum MERV rating. Note that the higher a filter is rated, the less air that is allowed to flow thru. This is what causes your furnace to work harder. Consequently, keeping that filter clean is a must! You might also want to consider switching to a permanent, rather than a disposable filter, as that will reduce waste as well as save you time and hassle. I believe it’s important to note that disposable fiberglass filters only trap 10%, up to 40%, of debris. For those of us that have pets (we happen to have two very affectionate and extremely lovable cats that, unfortunately, shed a good deal all the year round), consequently, disposable filters tend to not be up to the task at hand. Electrostatic filters are a valuable option because they capture 95% of airborne particles including pet dander, smoke, pollen and mold spores. The majority of electrostatic filters are permanent. This means that they should last a lifetime, although there are disposable (single use) filters available for purchase. Note that prices vary widely. If you suffer with asthma or other respiratory ailments, it may be worth considering a genuine (not “HEPA-like”) HEPA filter which can remove at least 99.97% of airborne particles. HEPA filters are based on Department of Energy standards. Given that a furnace needs to have adequate airflow to work efficiently and in order to adequately heat your home, replacing or cleaning your furnace filter each month in the winter is a MUST. Keep in mind that the cost of furnace replacement runs $6,000 to $8,000, or more! 2. Turn down your water heater to reduce energy costs and prevent scalding. ​While conventional water heaters are typically set to 140 degrees Fahrenheit (this is the default setting from most manufacturers), you end up paying for this, in terms of higher costs as well as the occasional scalding burn. The Department of Energy recommends having your tank-based hot water heater set to 120 degrees. By lowering the temperature, you can not only avoid a nasty burn but you can reduce your water heating costs by 6% - 10%. Many of my customers have opted for tankless (also called “on demand” units or instant hot) water heaters. There are some definite advantages to on-demand water heating. For one thing, a tankless water heater is compact in size so it takes up less space than conventional/tank type water heaters. They can virtually eliminate what is referred to as “standby losses.” This is energy wasted when hot water cools down in long pipe runs or while it's just sitting in the storage tank. In the Bay Area. tankless units typically operate on natural gas (although they can also operate on propane). The main advantage is the elimination of the extra costs associated with keeping 40 to 50 gallons of water hot in a storage tank. Consequently, you waste less energy. What my customers like most about the tankless units is that they offer a continuous supply of hot water, which is ideal for filling a big whirlpool tub. They also happen to be more compact than the standard water heater, and they mount on a wall, rather than sitting on a platform. If you’d like more information or an estimate on installation of a tankless water heater, please feel free to call me, or send me a text or an email. 3. Clean your gutters to prevent water damage. It’s that time of the year when the leaves start to fall. To protect your home’s exterior and foundation walls, it’s important to clean out your gutters and downspouts. The reason this is important is that once your gutters become clogged, any rain water that falls can all too easily back up, causing water to seep into your house. Once inside, water can cause a troublesome (and costly) flood, as well as unsightly (and expensive) water damage (not to mention potential issues with health-damaging mold). Homes with lots of nearby deciduous trees (i.e. trees that drop their leaves) face a much higher incidence of clogged gutters. It’s not uncommon for clogged gutters to get so heavy that they pull the gutters loose, rotting both the trim and siding. Even if your gutters don’t overflow, leaving any decaying debris in there is an invitation to carpenter ants, mosquitoes and other pests. In case you’re not familiar with carpenter ants, please be advised - you do NOT want them in your home! Unlike termites, who ravenously eat wood, carpenter ants hollow out the wood in your home to nest, causing their own variety of considerable (and costly) damage. Although there are plenty of gutter cleaning tools and technologies available today, most methods eventually involve getting on a ladder. If getting on a ladder is not something you’re comfortable doing, I encourage you to look into hiring a professional gutter cleaning service. If you are a do-it-yourselfer, then make certain that you wear gloves, a dust mask, and safety goggles. It’s especially important to make sure that your ladder is well-footed at all times! I suggest using a ladder stabilizer, or stand-off. These will help you keep from denting and damaging your gutters. Scoop all the accumulated debris into a sturdy garbage bag with a garden trowel. Once you have done so, then rinse the remaining detritus toward the downspout with a high-pressure nozzle on your hose and make every effort to scrub it clean. Do your utmost to avoid spattering the siding in the process. After this is accomplished, be sure to clear the downspouts with a hose or auger. To cut down on large clogs, I recommend installing leaf strainers at the drain tops. Again, if this isn’t your cup of tea, you can always call a pro! If you happen to spot staining on the siding of your home, this can be a sign of standing water in your gutter system. Stagnant rain water can cause damage to the fascia boards behind the gutters and on the shingles of your roof. If you suspect such damage, call or text me immediately so I can get out to your home to assess the problem and prevent any further damage. Remember that clogged gutters can do serious damage to your roof and fascia, culminating in roof problems and wood rot. Should water pooling occur near the foundation, this can cause a damaged or cracked foundation. Include the possibility of damaged or swollen siding, rotted decks or porches (if water falls on these structures), cracked and water-damaged driveways, as well as stains on concrete and siding. This all becomes both unsightly, and increasingly costly, to remedy! Water is a serious threat to your foundation. Things such as soil erosion or a cracked foundation can cause your home to shift. When you start dealing with foundation problems, it can get notoriously expensive to fix! Just remember that it’s much, much easier, and far more affordable, to clean and/or fix your gutters. 4. Seal air leaks to cut heating (and cooling) costs, improve durability, increase comfort, and create a healthier indoor environment. Before you even think about replacing windows and doors, installing a new HVAC unit or insulating the attic and walls, make sure that you tackle the air leaks in your home. This low-cost, high-impact fix will make a surprising difference in your physical (and financial) comfort level. While many homeowners often overlook this important fact, air leakage contributes not just to annoying drafts and higher heating costs, but also to moisture problems – problems that can affect your health and wellness, as well as your home’s value and durability. According to the U.S. Department of Energy, air leaks in your home can account for 5%-30% of your energy bill. Air leaks are commonly found around recessed lighting, door and window frames, chimney flashing and furnace flues. Sealing air leads is among the least expensive and yet most cost-effective measures you can take to improve your home’s comfort and energy efficiency. When you realize that air leaks are equivalent to leaving a window open, by safely sealing them, you can expect to see savings of 10% to 20% on your heating and cooling bills. If your home is older or especially leaky, that savings could be even higher! Now, before you run out to buy a caulk gun and weatherstripping, there are some very important things for you to consider. It is recommended that you reduce air leakage as much as possible, yet provide controlled ventilation as needed to ensure proper indoor air quality. Most older homes lack proper ventilation. As a consequence, they depend on cracks and leaks to let in needed air. This is particularly true when fuel-burning appliances are operating inside the home. Those can include furnaces, water heaters, clothes dryers, gas stoves, gas space heaters and fireplaces, to name a few. Without adequate ventilation, carbon monoxide and air pollutants from cleaning chemicals, combustion appliances, and off-gassing household products can build up. This can create an unhealthy – even dangerous – environment in your home. While opening a window affords ventilation, clearly there are times when doing so would not be practical – such as when it’s too cold, or too hot, outside. Gratefully, a licensed contractor can help you get all the energy savings and comfort possible from a well-sealed home, while ensuring your safety (and that of your loved ones) through proper ventilation. Keep this important fact in mind: your house is a system designed in such a way that every component in it works together. Simply by adding insulation and sealing air leaks, you can dramatically improve the energy efficiency of your home while also improving its comfort and durability. That said, it’s vital to recognize that every change you make to your home’s envelope – its walls, floors, and ceiling – and to the components in your home, will affect how it works to keep out the elements while keeping your family safe and comfortable. While many do-it-yourselfers can cost-effectively eliminate air leaks, if you accidently “tighten” your home’s envelope without providing appropriate ventilation, you can cause pressure imbalances or negative pressure in the house. Negative pressure can become a serious problem because it can set up the conditions for backdrafting of fireplaces or fuel-burning (combustion) appliances. Additionally, pollutants can be drawn into your home harming you and your loved ones. A properly trained and licensed contractor understands how systems work together to keep your house operating as it should. If you have any questions about the winterizing needs of your home, that’s what I’m here for – to address them and to help you better understand what your home may need to ensure its overall comfort, safety, durability and value. If you have enjoyed this blog, then please let me know by dropping me an email or commenting in my blog. Please feel free to share this blog with your family, friends and neighbors, or anyone else that might benefit from the information shared herein. Remember, if someone you know is looking for a licensed general contractor, I’m the man to call! 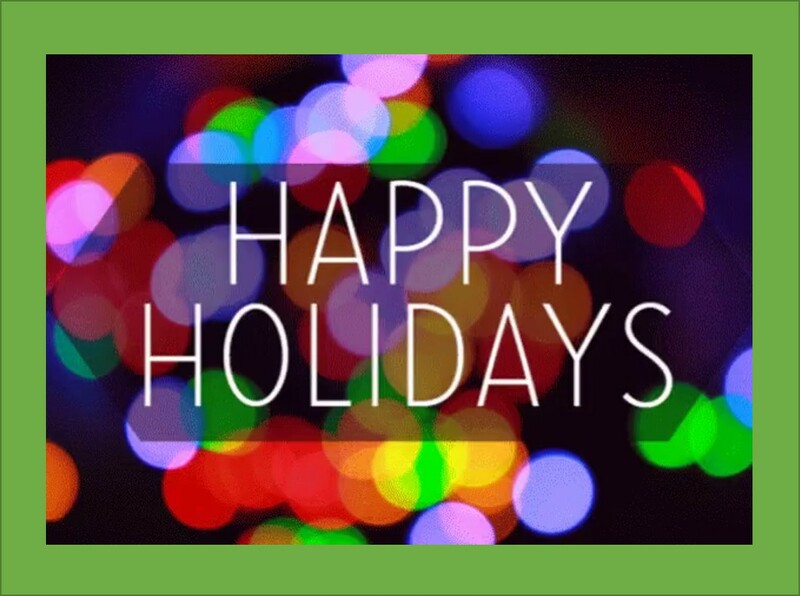 May you and your loved ones have the very Coziest, Healthiest and Happiest of Holidays! Don’t allow the remodeling of your bathroom to become a daunting challenge. Make sure to choose an experienced contractor that knows the ins and outs of bathroom remodels – one that is willing to sit down with you to discuss your thoughts and ideas before providing any kind of remodeling estimate. This article is all about “how” to proceed, what to consider and how best to set your priorities with a quick glimpse at some current trends and bathroom remodeling examples. ​Of course, in nearly every bathroom, you’ll find some combination of sink, toilet, tub and shower. However, with all the new technological advances in these primary bathroom staples, re-doing a bathroom can pose a daunting challenge to those homeowners unfamiliar with the latest options that can bring new style and functionality to the once modestly humble bathroom. 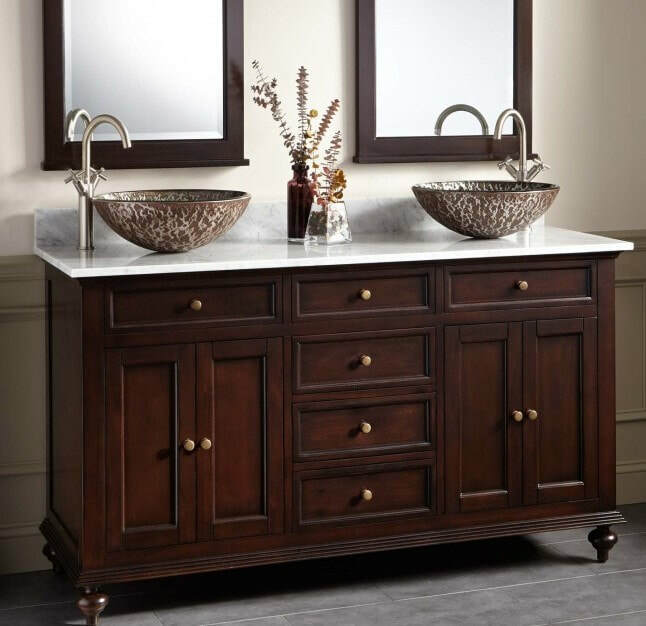 New trends – like pairing a vessel sink with fine furniture – can create a vanity of your dreams. ​Simply replacing an old wall covering with the latest iridescent glass tile can turn a ho-hum bathroom into a feast for the eyes. But, where do you start? How can you go about planning for a bathroom remodel without adding tons of stress to your already busy life? An important point here, is to choose an experienced contractor that knows the ins and outs of bathroom remodels, and that is willing to sit down with you to discuss your thoughts and ideas before providing any kind of remodeling estimate. If he wants your business, the contractor will take the time to meet with you in your home to review your existing bath, hear your likes and dislikes, and will work with you to explore some new ideas for improving one of the most important rooms in your home, turning your bathroom into your new sanctuary. Prices on bathroom remodels can vary widely, depending on the quality of materials and the quantity of new construction on the project. Definitely take the time to consider your remodeling options and to examine what is available today at the varying price points. Natural materials for countertops, like granite and marble, come at a price, but there are other options available, such as glass, tile, metal and wood that can offer greater affordability as well as style. Quality materials can definitely withstand the test of time. However, if you aren’t careful about where you spend your money, you can get high quality materials that don’t lend well to meeting your primary needs for, say, a space in the shower where you can sit to shave your legs. So, you may now have the top-end shower fixture that offers a regular spray, a narrow jet and a relaxing rain shower, but now you can’t afford the custom travertine tile shower seat you really needed to make your life easier and more comfortable each time that you shave your legs. ​It’s actually very important that you determine your priorities. 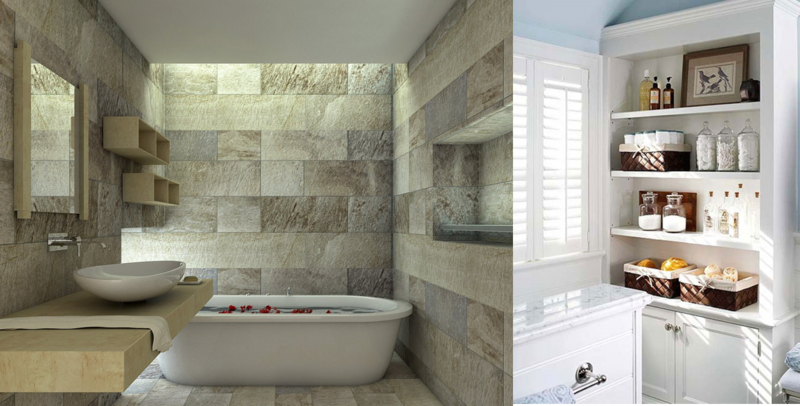 Do you want to have more lighting or a skylight (because the old bathroom was just too dark and uninviting)? Do you need more storage for your special bath soaps, candles and towels; or would a more minimal look be better if you are shooting for a spa-like feel with your new bathroom? Many of my clients start with a basic idea and then make various key modifications as they review the various lighting, fixture and sink and tub options available to them. While they may have initially considered completely replacing old cabinets, simple things, like fresh paint and new cabinet hardware, together with recessed lighting strategically placed, can completely change the look and feel of a bathroom for a more modest price. Consequently, set your priorities first: determine the existing items you want to change and the 2-3 key things that matters most to you in a new bathroom. Discuss your ideas and options with your contractor. Let him or her know where you think you might be willing to be flexible and where you want to ensure that you get exactly what you want. It’s important to remember that any remodel is a true team effort – an informed client, together with his or her experienced contractor – and know that once underway, things can crop-up. Common added expenses can arise from the need to replace sub-flooring due to water damage caused by old caulking or a leaking shower door. Don’t panic! There is a remedy, and it doesn’t need to break your budget if you have planned accordingly. ​It is important to note that if your home is more than 20 years old, you can likely expect the unexpected in terms of plumbing concerns or water damage. If you have done your homework, and you have trust in your contractor to advise you on what is absolutely needed versus what can be worked with or around, nothing need be a major surprise. Just keep your head about you and keep the lines of communication open between you and your contractor. A communicative contractor that is willing to answer questions and to provide explanation for any additionally required labor to repair hidden damage offers the best possible outcome for you and your home improvement project, as well as your budget. For expert advice and quality construction at affordable prices, contact ed@edneir.com, 408-368-7162. Experienced advice can turn your bathroom remodel into a valued investment and positive experience. Be sure to contact Ed today for a free estimate! Ed Neir has been helping homeowners enhance the value and beauty of their homes since 2000.